Yes the Yankees just landed Randy Johnson and I wouldn't be surprised to see them get Carlos Beltran either. They are still not better than the Red Sox. After reading Buster Olney's ESPN.com column yesterday - I had to remind myself that Buster was the beat reporter on the Yankees for many years and his "like" of the Yankees is well known. My bias is towards the Red Sox (but at least I'm upfront with that). I'll tell you how I see things and you decide. This is assuming that the Yankees sign Beltran - otherwise Johnny Damon has it in centerfield all over an aging Bernie Williams. This also grants that catcher and short are equal (arguments can be made by either side). The Red Sox also have a substantial edge in bench depth with Doug Mirabelli and Jay Payton coming off the bench (probably the best back-up catcher and outfielder in MLB). Tell me Buster - where is the Yankees' advantage? Is it in the fact that the Yankees will be dealing with Giambi and Sheffield steroid's questions all year? Or do the Red Sox have an advantage in that they now have the curse of the Bambino off their shoulders whereas the Yankees get to be reminded about the greatest choke-job in history all year? Is it in age? Because the starting line-up for the Red Sox averages 1.1 years less than the Yankees (and is therefore less prone to injury). Starting pitching? Well lets take a look. The guide-post seems to point to about a 15-9 type season with a 4.00 ERA (assuming that Johnson is better at handling NYC than either Clemens or Vazquez in his first year). I'm being generous here. Johnson couldn't do better than Roger head up in the NL this year - how is he going to be better than what Roger was able to do in NYC at age 36 when the Unit will be 41 going into 2005? The year before he arrived in New York - Clemens went 20-6 with a 2.61 ERA. 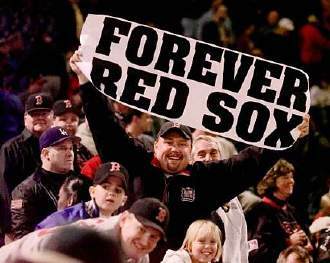 Do you think Johnson has a 20+ win season in 2005 like his buddy Schilling had with the Red Sox in 2004? Survey says - NO. At best - I'd rate the teams #1 starter as a draw. The rest of the rotation? The Yankees have Mike Mussina, Carl Pavano, Jaret Wright and Kevin Brown. This assumes that Kevin Brown is still with the team which is a big "if" because he's definitely persona non grata in Yankee-land. Who do they get to replace Brown if he's dumped? Not much left in the free-agent pool. Do you think the Red Sox would look forward to teeing off on Derek Lowe? Also consider that the Yankees farm system is pretty much bare - so forget making a trade. The Red Sox counter with David Wells as number 2. Let's stop here for a minute. Wells had a better winning percentage (12-8 vs. 12-9), more innings pitched (31 more) and a much better ERA than Mussina (3.73 vs 4.59 or 108 ERA+ vs 98 ERA+ - just to take the league differences into account). Tell me again how Mussina is a better number 2. I'll give you Pavano over Matt Clement but I won't give you Pavano over a healthy Wade Miller. Wright over Bronson Arroyo? Please. In addition to Wade Miller - the Red Sox can also offer up Tim Wakefield who had more wins, innings pitched and strikeouts than Kevin Brown. Hey Buster - tell me again why the Yankees will be so great next year. I could use a good laugh. AMERICAN DIGEST SPORTS EDITOR Chris Lynch serves his own brew daily at A Large Regular , and contributes to SportsPages.com.